China is one of Australia’s largest trade markets, which means that many Australian companies work closely with Chinese clients. As with all cross-cultural interactions, gift-giving is one that needs to be navigated well. Even the best intended gestures can be misinterpreted if cultural etiquette isn’t considered beforehand. Below is a smart list, one you should be very familiar with if you or your company is planning on giving a corporate gift to a Chinese partner. Refusing Is Polite. When presenting a gift, it is common for it to be refused a few times. This is considered to be a polite gesture. Do not get frustrated or feel like they are not open to your gift; they are very grateful. As such, you can practice the same when you receive a gift, refusing to accept it once or twice before acknowledging how grateful you are for it. Avoid the Number Four. Considered bad lack for many Chinese, especially Cantonese, the number four should be avoided in your gifts if at all possible. This includes offering a gift that comes in a set of four, such as a box of four chocolates, etc. Don’t Go Over the Top. An extravagant gift can make the receiver feel uncomfortable or embarrassed, which is why it’s smart to stick with something small and personal. Giving a gift that reflects your country or region you live in is seen as considerate and thoughtful. Avoid These Gifts. Certain gifts, although they mean well, carry negative connotations in Chinese culture. In order to avoid being misinterpreted, stay away from giving clocks, watches, handkerchiefs, or white flowers - all of these are associated with death. Scissors, knives, and cutlery are also to be avoided, as they are thought to represent the severing of ties. Wrap in Red. 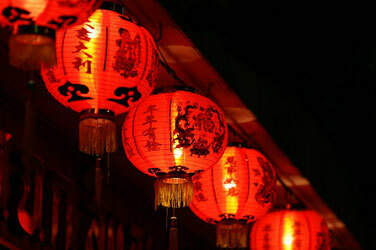 Red is an auspicious colour for Chinese, symbolising good luck and prosperity. Presenting a gift wrapped in red or incorporating the colour (like in a bow or ribbon) shows that you are wishing them good luck and providing them with good fortune.